Two ions are placed in separate, unconnected traps 1 meter apart. A “message” is imprinted on Ion A via a microwave pulse. Then the ions are excited into a state in which they emit one photon each. Either photon can be one of two slightly different wavelengths. 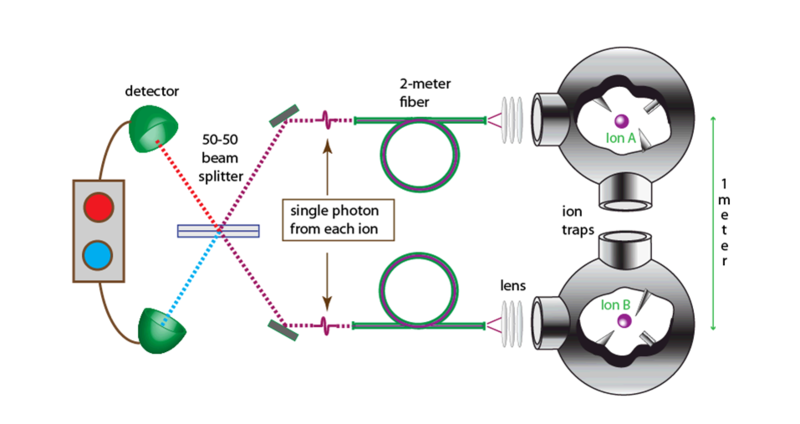 Those photons travel through separate fiber strands to a beamsplitter. Of all the possible combinations of photons, there is only one in which each detector will record an arriving photon simultaneously. But in that circumstance, it is impossible to determine which ion produced which photon, and that uncertainly projects the ions into an entangled state. Once the scientists determine that entanglement has occurred, they take a measurement of Ion A. Because its state is now known, and because it is entangled with Ion B, the researchers know exactly what operation to perform on Ion B in order to recover the teleported “message” originally written onto Ion A. This arrangement could serve as the basis for a “quantum repeater” in future quantum information processing networks.